CHICAGO (August 1, 2017)–Equality Illinois, the state’s LGBTQ civil rights organization, is recognizing 51 law firms in Illinois, a 25 percent increase from last year, for leading the way in 2017 in providing a welcoming and fair work environment for LGBTQ employees and for supporting the LGBTQ community. The recognition results from the annual Equality Illinois Law Firm Survey, which found that more law firms are willing to create affirming work spaces for their own employees, engage the LGBTQ community and demand that the vendors and contractors with whom they work show the same respect. “As the surveys were sent out earlier this summer, we expressed our appreciation to the law firms that are regular participants over the years, but we also focused on those that hadn’t previously replied, asking them to demonstrate their commitment to LGBTQ equality. We couldn’t be more pleased that a total of 51 firms, compared to 40 last year, rose to the challenge,” said Brian C. Johnson, CEO of Equality Illinois. “As civic leaders and protectors of our legal and civil rights, these firms lead other businesses to support their LGBTQ workers and job candidates and showcase how to be good corporate citizens,” Johnson said. 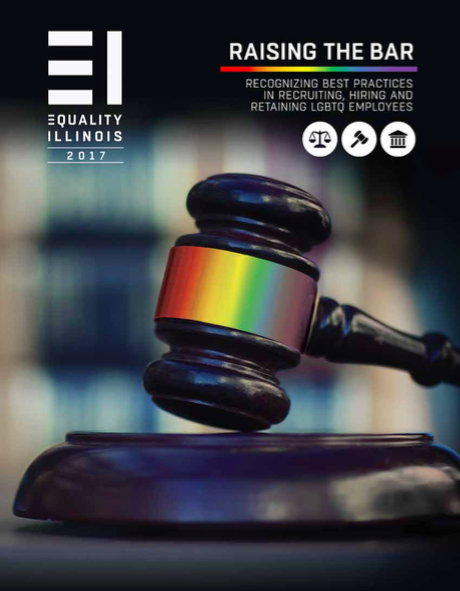 With the information gathered from the 2017 Equality Illinois Law Firm Survey, Equality Illinois identified the 51 law firms in Illinois that are leading the way to LGBTQ workplace equality and community engagement. • For the fifth year in a row, more than 98% of responding firms have an EEO policy or non-discrimination policy that expressly included sexual orientation. • 59% of responding firms have written gender transition guidelines documenting supportive firm policy on issues such as name changes, restroom accommodations, dress codes, and harassment. • In a growing trend, 52% of responding firms require their vendors or contractors to have a nondiscrimination policy that includes both sexual orientation and gender identity and/or expression in order to provide staff or engage in business with the firm. • 86% of responding firms include transition-related care in all company-sponsored insurance plans. • 100% of responding firms have a diversity council or workgroup with a mission that includes LGBTQ issues. • 84% of responding firms have an officially recognized LGBTQ affinity group that focuses on LGBTQ legal issues and clients. • 69% of responding firms require diversity awareness or employee training addressing sexual orientation or gender identity and expression on a mandatory basis. • 93% of responding firms actively recruit/hire LGBTQ lawyers. • 100% of responding firms support professional development of LGBTQ attorneys and staff. • 95% of responding firms provided financial support and/or resources to educational, political, and/or health-related LGBTQ organizations during the past year. • 82% of firms specifically market to the LGBTQ community or highlight their LGBTQ diversity in marketing and/or promotional materials. Equality Illinois works with law firms and many other businesses to improve their inclusiveness. For the recognized law firms, inclusion in the 2017 Equality Illinois “Raising the Bar” report is highly valued.